Once there was a snowman, frozen still with coal black eyes. Forever staring forwards as if there were only one scene worth seeing. The kind of snowman you see here and there and everywhere when there is enough snow. Children would pass his unmoving gaze, their laughter like Christmas bells as they rubbed their frozen fingers through their snow-filled hair. The snowman wanted to say ’hello’ and ’merry christmas’ and laugh with them as they made clumsy snow angels on the side of the hill. But he couldn’t say hello. He couldn’t move his smiling mouth made of stones. Inside he wasn’t smiling. Inside his big barrel-chest his ice heart was cold with loneliness, and a great sadness filled his fat round belly. Soon the sun went down for the days of winter are short but sweet. The snowman stood alone at the bottom of the hill. The sky was clear and the air was colder. If the snowman could have breathed his breath would have formed icicles from his carrot nose. His body solidified more than ever and he felt stiff as stiff could be. And so the cold days and colder nights would pass by as Christmas approached and the snowman stood firm as the children ran and played all around him. Sometimes snow would fall and add a couple of inches to the top of his straw hat, making him taller and wider. And still the children who had created him ignored him, and he felt ever more lonely. At last it was Christmas Eve and as the sun fell beyond the trees the children scampered off one by one, ready to leave mince pies out for Santa. They left with an ache in their hearts, wishing more than ever that the morning could come quicker than the year before. One very small boy was left, his nose red with cold in the dusk. For a moment he stared at the snowman, and then it was clear that he had an idea, as clear as if a light-bulb had actually appeared above his head. He ran up the hill and grasped handfuls of snow, packing it together with his small woolly gloves. He rolled the ball of snow back down the hill and it gathered weight and substance until it was too heavy for him to hold and it rolled under its own weight until it clumped with a thump, to rest at the foot of the snowman. The boy tumbled down after it. He climbed upon the ball of snow he had made, so that he was eye to eye with the snowman. “I’m sure you understand and won’t mind,” said the boy, and with that he plucked the knobbly long carrot from the middle of the poor snowman’s face and ran off. The snowman wished he could have spoken to the boy. Of course he understood that it was important to feed Santa’s reindeer. But now his face felt even colder, left as it was with just a hole where his nose had been. He was so lonely and cold. That night was the coldest, sparkliest, frostiest night of the year. So cold that the snowman had no choice but to fall into a deep frozen sleep. The kind of sleep with no dreams. When midnight struck and it was at last Christmas Day, a little robin flew by, it’s redbreast filled with the joys of Christmas time. It noticed that the poor snowman looked sad in its slumber and had no nose. The robin perched itself gently atop the snowman’s hat, puffed up the orange feathers of its chest and began to sing. The most beautiful joyous song of Christmas. Now robins don’t normally sing at night so this was an unusual sound that floated up the hill and over the trees of the forest, far into the clear star-filled sky. And it just so happened that at that very moment a certain sleigh was jingling past high in the sky. A sleigh that flew with nine bright reindeer pulling it joyfully forward. The first reindeer, whose name I am sure you know, heard the robin’s song as it twinkled past. He turned his head and whispered to the reindeer behind. And each reindeer in turn whispered to the next until at last the whisper made its way to Santa’s ear. And, as is so often the way of things at this time of year, Santa smiled the biggest of smiles. The next morning, Christmas morning in fact, the snowman woke slowly as the light began to rise over the hill. He felt like he wanted to yawn and stretch from his long sleep and looking down he found that his stick arms were stretching wide and his back was flexing. He could move! The thought made him smile even more and his stone mouth grinned just like all the children were grinning in their homes as they opened their presents. A grin just like Santa grinned. 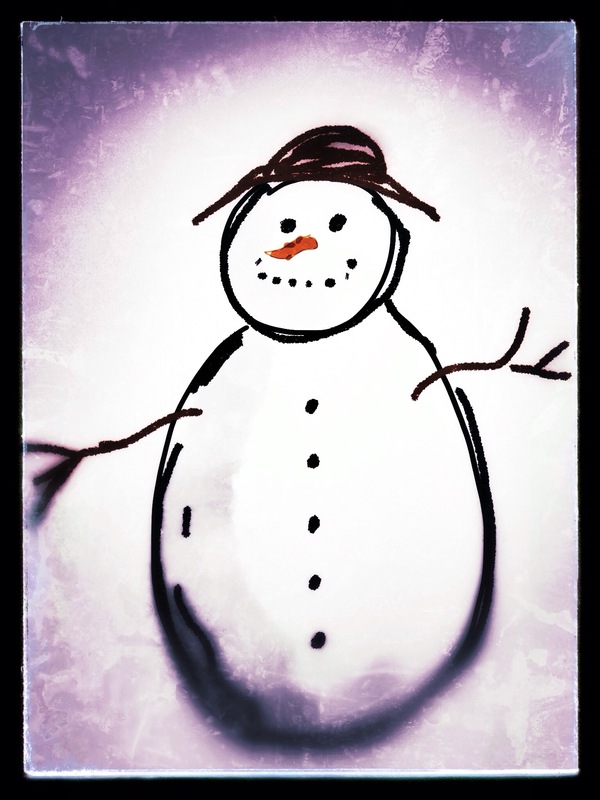 The snowman reached up with his stick fingers and felt the new, perfect shiny carrot nose that was firmly in his face. This made him smile even more. He looked around, and there, sat on the snowball the small boy had made, was the robin, and beyond that were all creatures of the forest, great and small.